If you are working, one of the most important elements for you is receiving your salary accurately and on time. Is there a Philippine payroll software that can actually do that especially now that businesses is facing greater challenges locally and regionally? With the advent of the ASEAN Economic Community and the ASEAN integration businesses would have to compete not only with local companies, but also with competitors in the ASEAN region not only with their products but with their employees as well. This is the main reason why businesses should already be upgrading their system and looking for ways to improve business processes. Payroll is one of the most important business process, but most of the time the way that it is being done is mostly overlooked. 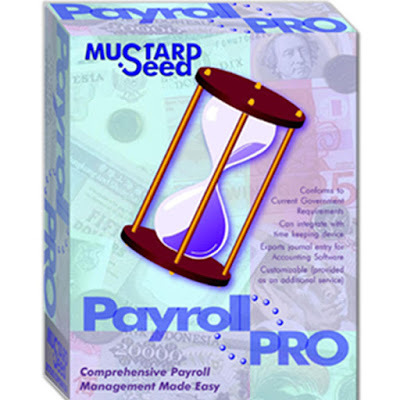 In 1999, Mustard Seed Systems Corporation developed an in-house Payroll software – Philippine Payroll Software out of its own need to improve its payroll system. • At a cost of just Php25, 900 you do not just get the payroll software, but you also get a FREE Biometric Timekeeping Device that will enable you to work with your payroll system more accurately. Philippine Payroll Software is perhaps one of the most recommended payroll systems in the Philippines coming with a basic, standard, professional and enterprise versions. For more information regarding this payroll system, please contact +63 (2)535-SEED / 63(2)535-7333 or e-mail sales@mseedsystems.com.